Karyn Foley-Cormier is a true example of what it means to be a dedicated roller skating coach. She consistently goes above and beyond to get her skaters to reach new levels, both in competition and industry tests. She pushes her skaters to new levels that they develop themselves, proving time and again that her efforts are worth every minute as she watches her skaters excel. Asking other’s input for the betterment of the skater is another one of Karyn’s strengths. Her goal is the improvement of the skaters and the advancement of our sport, and she has no fear of working with other coaches to reach this end, often offering assistance where needed. Other coaches who also judge will often ask her to watch their skaters while they are on a judges’ panels at the same time as their own skaters’ events. This level of respect is shown on both a local and national level. 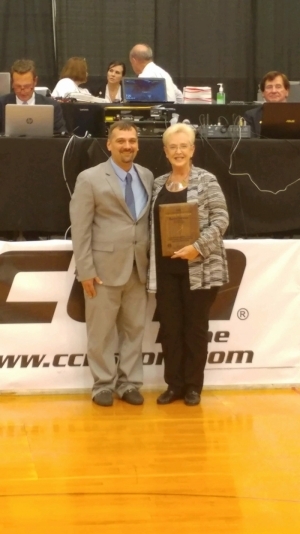 During the 39 years Karyn has been teaching, she has had national champions and placements every year. She has taught skaters from beginning lessons up to World Class. Of her skaters not on the podium, more often than not, they were finalists in their events. Karyn has shown that despite obstacles, she is available for her skaters at all times, adjusting schedules when needed to work with new skaters, making sure they received everything they needed. She was able to take six of them to Nationals representing eight champions and placements with five of them in challenged A events having eliminations and finals covering freestyle, solo dance, team dance, figures, and loops. Along with coaching, Karyn is a National panel judge and judges on all test levels. She is often asked by other regions to judge their local and regional competitions, including Gold Medal test centers. She has been a mentor to new judges on every level and encourages established skaters to get involved with judging, refereeing, stewarding, tabulating, or all of them combined. Karyn teaches all levels of beginner classes at the rink and has created new in-between classes to transition from classes to the artistic competitive team up to World Class events. She has recently added the precision team and quartets to the already busy list of figures, dance, and freestyle lessons she gives.